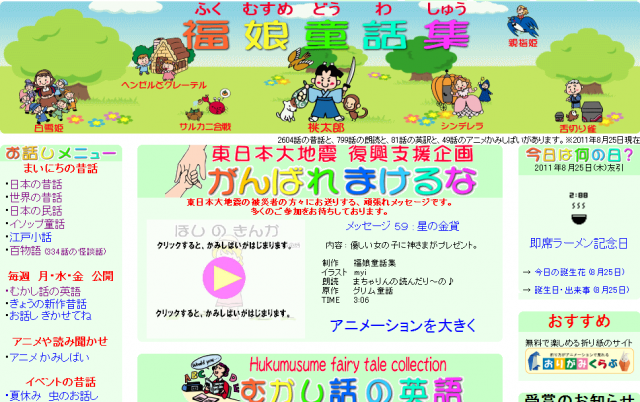 This is a website where you can hear traditional folk tales, legends and fairy stories - from Japan and all around the world - read aloud for you in Japanese. You can listen to readings of Japanese legends and folklore, short stories from the Edo period and traditional ghost tales. The website includes not only the audio but also text of the stories. 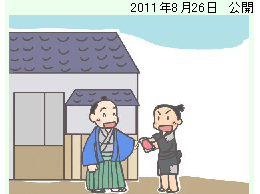 There are animated 'kamishibai' (Japanese-style picture story shows). You can look for specific stories using a keyword search. or searching via the menu on the left of the screen. The main contents to do with Japan are underlined in red. 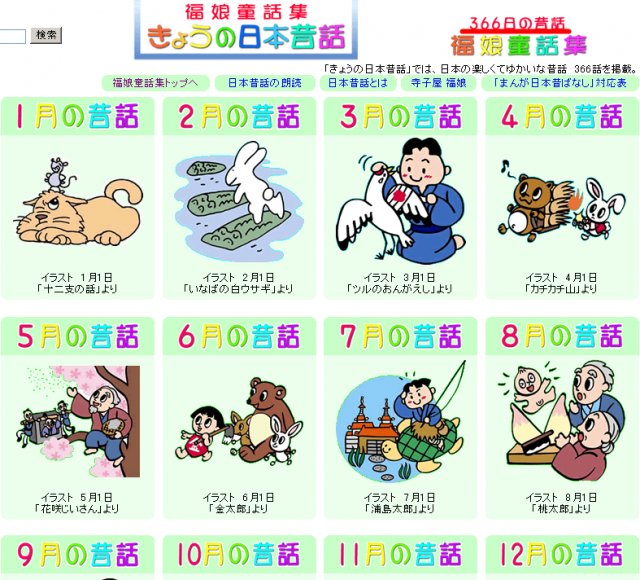 We took a look at '日本の昔話' (Japanese folk story). Just as it says in "３６６日の昔話" (366 days of stories), each month, every day - from the first to the last of the month - there is a new story recorded. If you continue listening to one story a day, you'll find a whole year goes by. Each individual story is only around 3 minutes long. If you can keep up with listening each day, you can expect some good results, don't you think? As well as the title, there is a short summary of each story. You can also see how long each one is. Click on 'お話表示' (Show story) to have the text displayed. 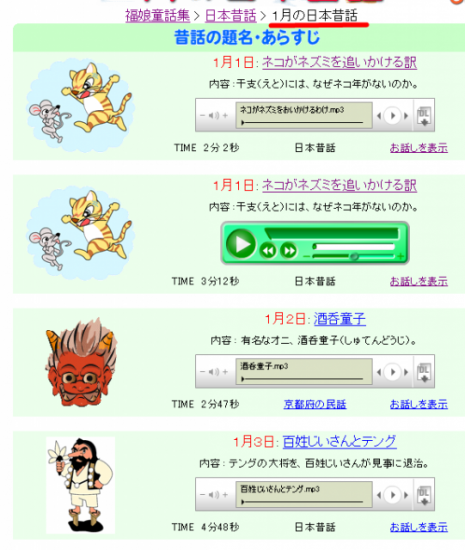 In addition to hiragana, conversations where it says "show story" are available in English and Chinese as well as Spanish. Please give it a try. Also, the site has links to Origami Club (Introduction article) which introduces origami to match the available stories. Some of the stories have more than one audio source. As the sound effects, individual dramatic style and so on will probably differ for different speakers, the length of the audio may vary, although the basic content remains the same. Since you can enjoy different versions with different readers, it might be interesting to listen to each and compare them. There are talks that are broadcasted in English, too. 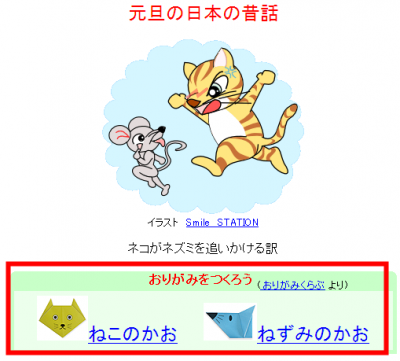 The written stories don't have furigana attached, but don't worry because you can always use the website with a ruby furigana-generating tool such as Hiragana Megane (Introduction article). As well as this, in 'アニメかみしばい' you can listen to more folk stories in the form of animated "kamishibai" picture shows. Many tales from around the world are introduced here too, so it might be interesting for you to try listening in Japanese to stories you heard when you were little. 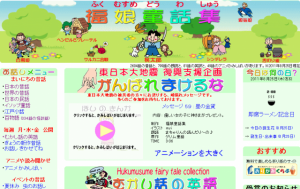 In 'むかし話の英語' Hukumusume fairy tale collection (English) you'll find both Japanese and English writing and audio, making these useful contents for beginners who understand English.